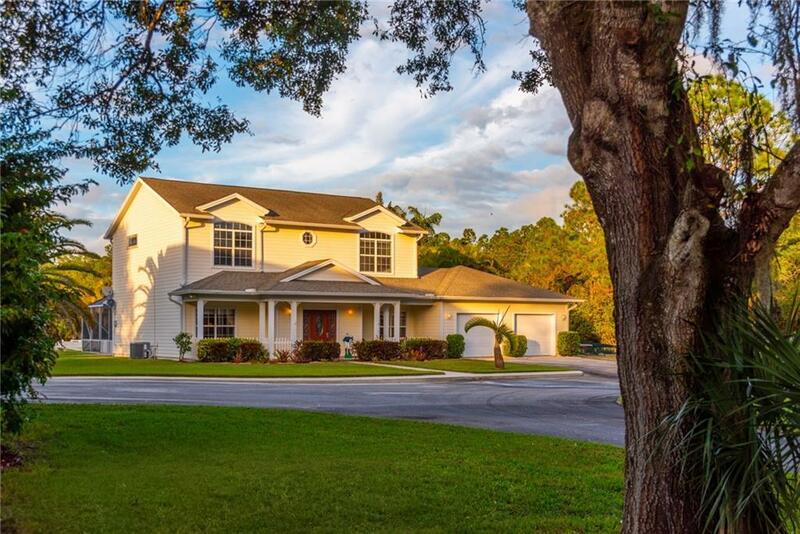 Lovely 5 acre equestrian property has 2 story main house with 4 Bedrooms, 3 Baths, 4 car garage (2 attached, 2 detached) heated, screened pool and 2 Bedroom, 1 Bath guest apartment with its own attached garage space. Double driveways with electronic gated entry to property; 1 to main house & 1 to guest apt & barn. Property features 10 stall barn w/tack room & office, wash stall, tack stall; run-in shed with 2 spare stalls, 10' x 10' dog kennel & storage, 5 post & rail fenced paddocks with automatic water bowls, Regulation Olympic size Dressage training arena with special surface - ESI All Weather Footing, same as used in Wellington arenas, with excellent irrigation system. Whole property is double fenced around exterior, very private, well maintained grounds w/landscape lighting. Home features a generator, shutters, new A/C 2017, pool heater 2016, exterior painted 2016. NO HOA. 1 Year Home Warranty Plan.